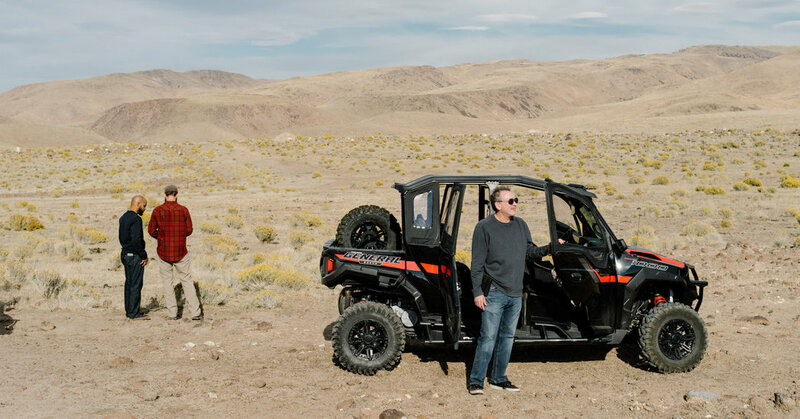 The man who owns the company, a lawyer and cryptocurrency millionaire named Jeffrey Berns, put on a helmet and climbed into a Polaris off-road vehicle last week to give a tour of the sprawling property and dispel a bit of the mystery. After his driver stopped the Polaris on a high desert plateau, surrounded by blooming rabbit brush and a grazing herd of wild horses, Mr. Berns, who is 56, pointed to the highlights of his dream community. “You see that first range of mountains,” he said, pointing south. “Those mountains are the border of our South Valley. That’s where we’re going to build the high-tech park,” a research campus that would cover hundreds of acres. There are also plans for a college and an e-gaming arena. As strange — even fantastical — as all this might sound, Mr. Berns’s ambitions fit right into the idiosyncratic world of cryptocurrencies and blockchains. There is a fuzzy line between these utopian visions and get-rich-quick schemes. Several cryptocurrency projects have been shut down by regulators; apparent hucksters have been arrested; and a plan to transform Puerto Rico with cryptocurrencies has been criticized as nothing more than a bid to take advantage of the island’s status as a tax haven. Mr. Berns was drawn to Nevada by its tax benefits, including the lack of income taxes. And the breadth of his ambitions certainly raises the risk of a boondoggle. But he is different from his crypto-brethren in one big way: He is spending his own money. So far, he said, he has spent $300 million on the land, offices, planning and a staff of 70 people. And buying 67,000 largely undeveloped acres is a bit of old-fashioned, real estate risk-taking. Still, Mr. Berns said his ambition was not to be a real estate magnate or even to get rich — or richer. He is promising to give away all decision-making power for the project and 90 percent of any dividends it generates to a corporate structure that will be held by residents, employees and future investors. That structure, which he calls a “distributed collaborative entity,” is supposed to operate on a blockchain where everyone’s ownership rights and voting powers will be recorded in a digital wallet. Mr. Berns acknowledged that all this is way beyond what blockchains have actually accomplished. But that hasn’t discouraged him. Mr. Berns has managed to win over local officials who are eager for economic development. Nevada’s governor, Brian Sandoval, read a proclamation that named the Blockchains property “Innovation Park” at an event last month where Mr. Berns sat on a panel with the governor and Elon Musk, the chief executive of Tesla. Tesla’s Gigafactory in Nevada, which has been described as the largest building in the world, is surrounded by Blockchains’ land. Companies like Google, Apple and Switch also have properties in the industrial park that is surrounded by Mr. Berns’s holdings. This week, he announced a memorandum of understanding with one of the state’s main power companies, NV Energy, to team up on projects that will run energy transactions through a blockchain. The Nevada county where this is all located, Storey County, has only about 4,000 residents and was best known, until recently, for its history of silver mining and its modern brothels, including one owned by a county commissioner. That same county commissioner, Lance Gilman, bought the land surrounding the brothel and turned it into the industrial park where Tesla and Google are now located. Blockchains has already received preliminary county support for a new town along the Truckee River, with thousands of homes, a school and a drone delivery system, and is working closely with the county on a broader master plan. But for now, Blockchains is empty land and a repurposed office building. Mr. Berns said the company won’t begin construction on the broader property until late 2019, at the earliest, after putting together the master plan and getting it approved by the county. The office manager from Mr. Berns’s old law office in Los Angeles, Joanna Rodriguez, moved with her four children and husband to Nevada. Mr. Berns spent most of his professional life on class-action lawsuits, many of them against financial companies. He learned about Bitcoin in 2012 but was won over by another cryptocurrency, Ethereum, which makes it possible to store more than just transaction data on a blockchain. Mr. Berns bought Ether, the digital token associated with Ethereum, in a big sale in 2015. Thanks to an astronomical increase in the price of Ether and some well-timed selling last year before it crashed, he became wealthy enough to fund his dream project. Ethereum is what he believes makes his community more than just a giant real estate project. To understand why requires more than a bit of imagination. And faith. Every resident and employee will have what amounts to an Ethereum address, which they will use to vote on local measures and store their personal data. Mr. Berns believes Ethereum will give people a way to control their identity and online data without any governments or companies involved. That is a widely shared view in the blockchain community, but there are significant questions about whether any of it can work in the real world. Most blockchain companies have failed to gain any traction, and Ethereum and Bitcoin networks have struggled to handle even moderate amounts of traffic. Mr. Berns believes that one of the big problems has been security. People have been terrible at holding the private keys that are necessary to get access to a Bitcoin or Ethereum wallet. He wants to address that with a custom-built system where people’s private keys are stored on multiple digital devices, kept in vaults, so that no one device can gain access to the keys. He has already purchased vaults that are burrowed into mountains in Sweden and Switzerland, and he plans to build additional vaults in the mountains in Nevada. The other thing holding back Ethereum, Mr. Berns believes, has been a lack of real-world laboratories. His Nevada land, he hopes, will change that.